Friday: We focused on M’s working pieces today, since her lesson is tomorrow. With Allegro, M can play each section quite well, but at the end of each one, she pauses to figure out what comes next. 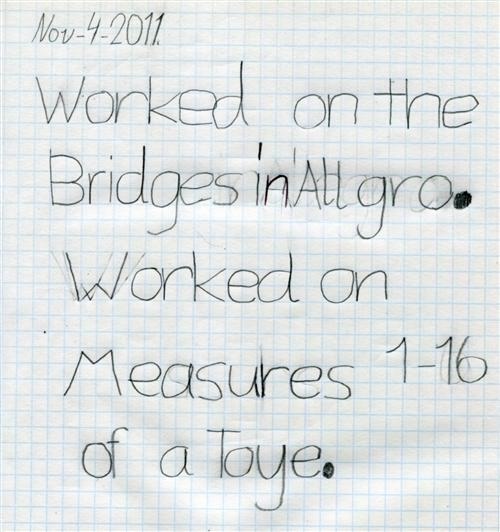 So we worked on the bridges between sections. With A Toye, we’re still in the assembly stages. M was only assigned the B section last week, so we are just working on stringing the sections together. M did a pretty good job of the first 16 bars. Today or the day before, I read M the Practiceopedia chapter about “building bridges” — connecting sections. It was timely, because as M is learning the individual sections of both A Toye and Allegro, she’s having trouble stringing them together. So today we focused on bridges. 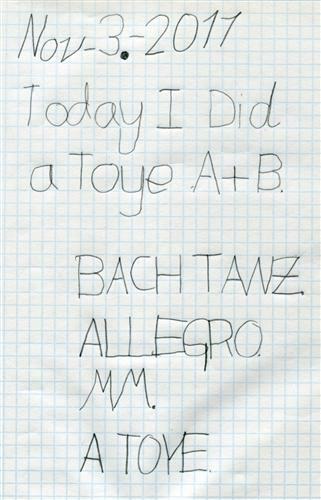 For instance, I had M play the last measure of one section of A Toye and the first two measures of the next section. It seemed to help. 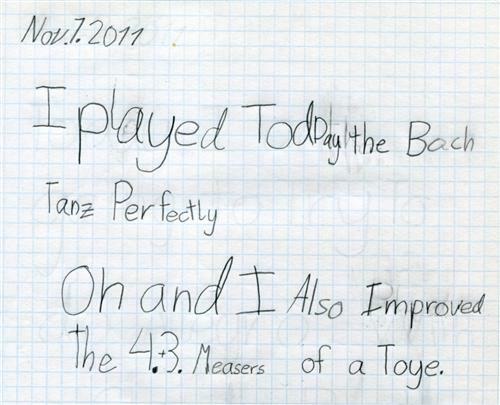 “Perfectly” might be too strong a word for how M played the Bach Tanz, but she did a nice job. Sunday: Today we made a soda-straw oboe. Hilarity ensued, and we joked about how M can now play yet another instrument (on top of the guitar and penny whistle). This has troubled me a little, particularly because our guitar practices have gotten a lot better overall. She’s fighting me less, and we’re getting more done, so I’ve been hoping that she was starting to buy into the guitar. And her remarks about switching instruments made me think that she’s still not buying in. M: Well, when I was talking about playing something else, I wasn’t talking about quitting the guitar. I was talking about learning another instrument. 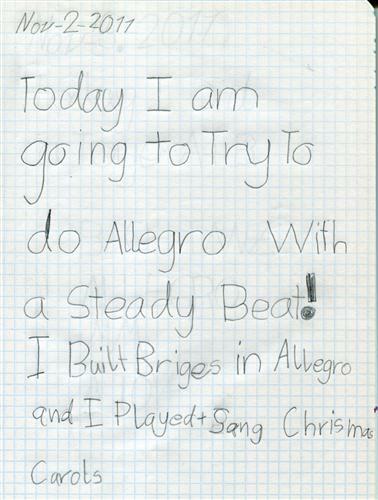 On a nuts-and-bolts level, M’s studio teacher told M to practice Allegro and see how far she can get without making a single mistake, and to try to get farther and farther with practice. The point of the exercise is to increase M’s attention and her conscious control of her playing. Right now, her fingers are leading, and her brain is following, so M makes a lot of mistakes because her fingers get into a pattern found in some other song (or in a scale) rather than the pattern of the song she is playing. To play without errors, M must slow herself down, bring her attention to her left hand, and make sure that she is looking ahead and planning mentally before her fingers need to move. Put simply, M needs to keep practicing: “Stop. Prepare. Play.” And she needs to practice this within songs as well as when starting a song. Today, we worked on the Bach Tanz, 1st section, because she usually makes two mistakes in it: (1) playing a C# instead of a D for the last note, and (2) skipping the repeat. 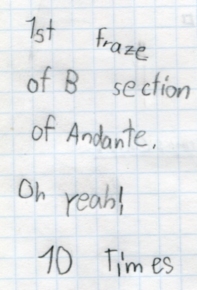 We also worked on the B section of Allegro. Posted on September 25, 2011 September 25, 2011 Categories Home-lesson recapsTags good daysLeave a comment on She’s a multi-instrumentalist!